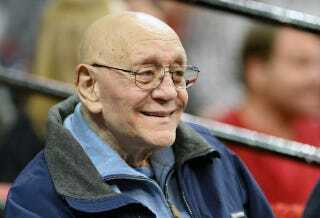 According to his son, legendary college basketball coach Jerry Tarkanian has passed away today in a Las Vegas hospital. The 84-year-old had been battling a respiratory infection for the past few days, and various health problems for months. Tarkanian, a Naismith Hall of Fame inductee in 2013, is most famous for his nearly two-decade stint with UNLV, where he led the Runnin' Rebels to four Final Four appearances, including a championship in 1990. Upon leaving UNLV, he coached the San Antonio Spurs before disagreements with ownership got him fired 20 games into his first season. Maybe as famous as his coaching record were his various spats with the NCAA. Tark's teams were almost always under strict scrutiny for compliance issues. At one point, the NCAA barred him from coaching for two seasons. Tark challenged this ruling on due process grounds and the case, which spent over a decade in appeals, eventually making it to the Supreme Court, where it was upheld. Late in his career, Tarkanian sued the NCAA on harassment charges, claiming they had specifically targeted him for much of his career. Without any admission of guilt, the two parties reached a multi-million dollar settlement. Tarkanian's belief that the NCAA enforcement mechanism was unworkable was summed up in one of his most famous quotes: "The NCAA is so mad at Kentucky it will probably slap another two years' probation on Cleveland State."